Modernism has for a long time had a simple mantra: a house is a machine for living in. But with the world moving into a consciousness for sustainability, there is a growing need for architects to explore the derivatives of their concepts. To counter this, Ma Yansong of MAD Architects has been championing his ‘Shanshui City’ concept – a model that combines nature with the built environment to inspire sustainable lifestyles. For a long time, the skyscraper typology has been a symbol for technological prowess and a show of the power of multi-national co-operations – and in many ways it still is. But the result has been the creation of grid-like cities with concrete boxes that lack spirit – concrete jungles that rarely add to the quality of urban life. Turning their backs on the sorry states of most cities, MAD Architects looked at the thriving ecosystem of a forest to create Absolute Towers, a residential complex in Mississauga, Canada. A brainchild of real estate developers, Fernbrook & Cityzen, Absolute Towers came into being through an international architectural competition that saw MAD Architects’ proposal shortlisted and later awarded. 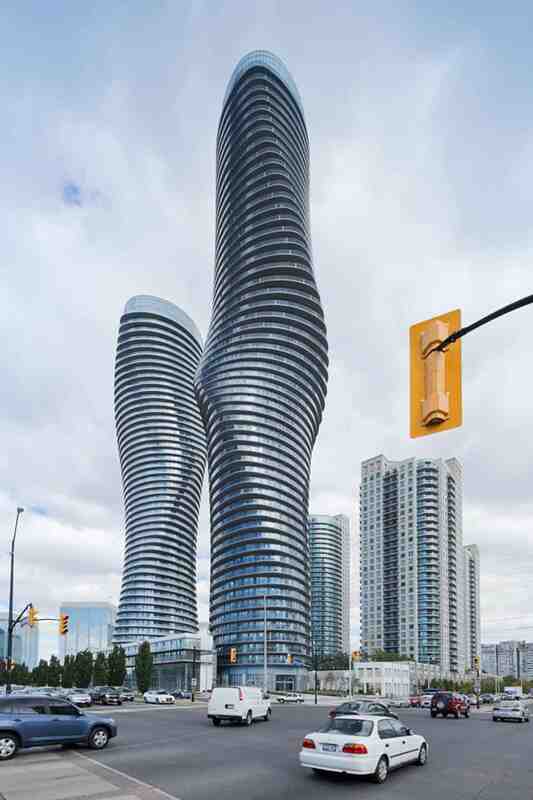 It is comprised of two towers that ‘dance’ in a sinuous jig as they rise to claim a spot in the Mississauga skyline. The organic forms are simple and delightful – easy on the eye. With the city seeking a new identity and enduring landmark, the architecture’s twisting fluidity inspired by natural lines found in life has come to have an emotional connection with the locals. Key to the design team’s approach was to provide each resident with a unique experience of the city. Continuous balconies that encircle every floor plate create the possibility of communal encounters and exposure to wind and sunlight. Moreover, the balconies are done in such as way as to act as sun-shading elements during the summer and to bring in the sun during winter. As you zoom out, these unique floor plates come together and are blurred to connote the unpredictability of the human experience in urban life. The building gracefully sits at the junction of two major streets: Hurantario and Burnham Thorpe. The site called for a unique response and MAD chose to contrast with the backdrop of banal rectilinear urban block typologies with something delicate and naturalistic. The scheme goes beyond the brief of most real estate developers to provide not only mere floor area efficiency but also an ‘airy’ building that the residents are proud of. But how is such a composition achieved? To break the sheer verticality of the two blocks, the floor plate rotates between 1 and 8 degrees and morphs uniquely, framing panoramic vistas beyond. The torsional forces resulted by the form of the twisting towers are resolved by the use of load bearing concrete walls. These walls lengthen and shorten depending on the uniqueness of a particular floor plate. To add to the dynamism, the balconies cantilever from this structural system, and are thus able to take up an organic free form. Standing tall and free within their context meant the towers would have to be able to handle significant wind loads. The organic volumes used in the Absolute Towers are able to streamline the effect of wind better than a rectilinear typology would. And with the community balcony idea being a selling point for the development, safety and comfort was a priority. The concept of sustainability today is often reduced to the lowest common denominator. Architects that are ‘pro-sustainability’ push for saving energy whilst ignoring the inner yearning of man to return to nature. However, MAD’s approach appreciate that sustainability is a much broader concept – one that incorporates architecture with not only nature but the art, poetry and literature that constitutes life. Absolute World stands in defiance to the common sustainability stereotype. The architects have successfully created a symbol that will hopefully chart new directions and inspire a holistic approach to sustainability.